There is a difference between being a good coach and being a good man. That’s worth remembering as Urban Meyer is lauded and celebrated after his decision Tuesday to step down as Ohio State’s coach – a decision he should have made four months ago, mind you. A decision that should have been made for him, really, after it became clear he’d enabled an alleged domestic abuser, then lied about it to protect his own reputation. Meyer is, without question, a great coach, one of the best the college game has ever seen. Three national titles, a career winning percentage of .853 before his final game and dozens of players who made it to the NFL. He is also callous and calculating, willing to bend his morals to fit his needs. Though he spoke often about the importance of character and accountability, and how he insisted on both from his players, his true guiding force was self-preservation. That was made abundantly clear this summer as Meyer lied about what he knew and when about former assistant Zach Smith’s history of alleged domestic abuse and did whatever he needed to cover his tracks. The “misstatements” at Big Ten media day. The sudden curiosity about erasing old text messages. The unusual lack of communication between him and wife Shelley about her knowledge of Smith’s potential for violence. “I didn’t feel that I’d seen high-integrity behavior,” said Jeffrey Wadsworth, who stepped down as an Ohio State trustee in protest of what he saw as the school’s light punishment of Meyer. Yes, Meyer was suspended for three games. But they were not games of consequence because God forbid Ohio State impose discipline that might actually send a message or – gasp! – have an effect on the season. Had Meyer really wanted to set an example, to show his players that accountability is more than some word scrawled across a white board in a locker room, he would have owned up to his mistakes and stepped down in July. Or August. Or September. Instead, he made excuses for himself and became indignant when pressed for answers. Worse, he did and said nothing as a woman who’d been allegedly abused by her husband was victimized by the court of public opinion. It was a month before Meyer even bothered to mention Courtney Smith’s name, and if he’s made a sincere apology for his role in the hurt she’s been caused, I’ve yet to see it. By both his inaction and indifference, Meyer repeatedly put Courtney Smith – and eventually her children – in harm’s way. Endangered other women, too, by dismissing the idea that abuse occurred simply because there were no criminal charges. How that squared with the 2009 arrest report in which Gainesville, Florida, police labeled Zach Smith the aggressor, Meyer never quite explained. Somehow, Meyer made it so he and Ohio State were the aggrieved parties in all of this. He’s still doing it. 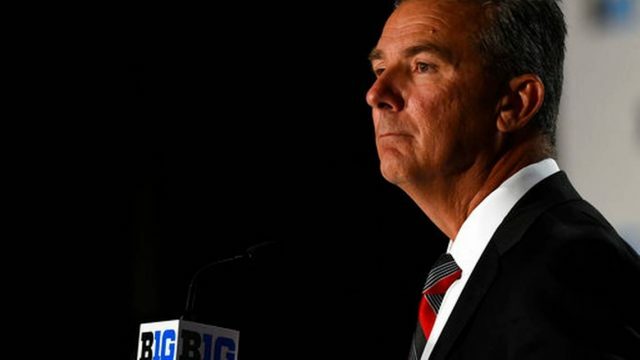 When asked if the scandal and suspension had anything to do with his decision to retire, Meyer called it “a very difficult time” and said it was one of many factors. In trying to make a case for Ohio State to get the last spot in the College Football Playoff on Sunday, Meyer said his team deserved credit for winning the Big Ten title after what he called an “emotional year.” That’s right. In Meyer’s book, the furor that erupts from covering for an alleged domestic abuser is not an appropriate response but rather a burden to be overcome. That’s not leadership, and it’s sure not a sign of good character. If he means winning, there’s no question. But as a role model for his players, Ohio State fans and everyone who cares about the broader impact sports has on our society, Meyer fell far short. For that, he will not be missed.